Is there anything better than hearing a burst of laughter coming from your tween while reading? 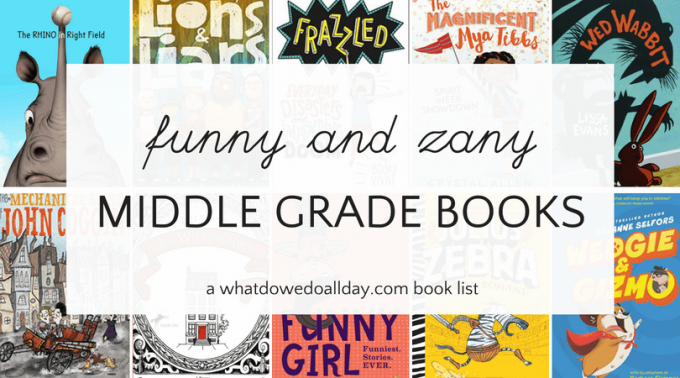 This list of funny middle grade books exists for the sole purpose of making your child laugh. What sets this list of humorous tween books apart from other funny book lists is that I haven’t populated it solely with book that rely on fart jokes and gross slapstick (not that there is anything wrong with that, I love a good fart joke, myself.). The books on this list range from the chuckle-worthy to the laugh-out-loud-snort-milk-out-your-nose. I’ve included dark humor, quirky reads, realistic laughs and slapstick. These funny middle grade books are suitable for children ages 8 to 13, so think 4th grade to 8th grade. For those of you who regularly follow my book lists (P.S. I love you), you will be delighted to realize that these middle grade books are all fresh titles! So even if you’ve waded through my list of the 100 funniest funny chapter books, your children have even more funny books to read! Frazzled: Everyday Disasters and Impending Doom by Booki Vivat. Abbie Wu is starting middle school and she is looking for something to be “her thing.” Abbie is also a little bit high strung and so when she and her friends decide to institute a lunch time revolution, the results are hilarious. Young readers who like their books to have a heavy dose of doodling will love this book – very refreshing and honest about the struggles of early teens trying to find their place, as well as all the embarrassing moments that take place on the journey. The Rhino in Right Field by Stacy DeKeyser. I loved reading this and it’s an excellent funny book for 8-12 year olds, especially those who love baseball. Set in the late 1940s, the story follows Nick Spirakis, who is the son of Greek immigrants, who plays ball with his friends in the field by the zoo. The field contains perils, such as Tank the Rhino, who lives just beyond the outfield (where balls occasionally land!). When the local baseball team comes under the control of a new owner, Nick and his friends vie for a spot as the batboy. Amidst the humor and action, the story also addresses life as an immigrant, dealing with bullies and the status of girls who play baseball. Overall, an excellent and at times hilarious middle grade book, and I think it would make a good funny read aloud book, too. Lions & Liars by Kate Beasley. When Frederick Frederickson (the name says it all), 10 year old misfit, accidentally sets himself adrift down the river, he ends up marooned at Camp Omigoshee, a disciplinary camp for boys. The counselors mistake him for one of the campers and Frederick wonders if this is his chance to reinvent himself. The others campers are just as quirky as Frederick, and together they forge a rather strange, but ultimately honest friendship, as true personalities are revealed. I really liked this book, and especially how Frederick learns to see power and privilege in a new light. Wedgie and Gizmo by Suzanne Selfors. I had great fun drawing upon my silly voices superpower when reading this hilarious book aloud to my son! The narrative voice alternates between Gizmo, the self-proclaimed evil genius guinea pig, and Wedgie the rather dim-witted corgi who become part of the same household when their families merge. Selfors absolutely nails the personalities of the two creatures and your children will be rolling on the floor in tears of laughter. You’ll never be able to say the phrase, “furry potato,” with a straight face again. Bonus, this is a series, and when they come across a funny book series, kids keep reading! Julius Zebra by Gary Northfield is another funny book series for kids! I’m embarrassed to say that it was one of my son’s 9 year old friend who pointed out the title character is a pun on “Julius Ceasar!” This is a silly, ridiculous, tale of a “definitely not a stripy horse” who is taken from the African savanna and transported to Ancient Rome, where he must train as a gladiator. With that premise, you can imagine that this book is one big zany adventure. The text is peppered with many black and white drawings and speech bubbles and kids won’t stop reading until they finally reach the end, after which they will pick up the next book in the series. Wed Wabbit by Lissa Evans. When I first started to read this book I thought I had been misled about the humor, but as the book went on the laughs started to ratchet up. Fidge is excited about taking a vacation with her mom and 4 year old sister, Minnie. But when Minnie gets into an accident, Fidge has to stay with her overly anxious cousin Graham. Soon Fidge finds herself and Graham thrown in the middle of a bizarre world populated with the whimsical Wimbley Woos and ruled by a usuper king, who just so happens to be Minnie’s stuffed toy, Wed Wabbit. Hijinks ensue. But in the midst of this uproarious and hilarious middle grade novel is a touching story about two kids finding their way back home and growing up. Guys Read: Funny Business ed. by Jon Scieszka. Funny middle grade books need not be restricted to novels! I really enjoyed reading this collection of short stories aloud. Although Scieszka’s series is called “Guys Read,” there is no reason why girls won’t also enjoy these stories by well-known authors. The funny short stories range from hilariously outrageous to silent-chuckle worthy. What I love best about this collection is that readers get an introduction to the authors (such as Kate DiCamillo, Mac Barnett and Christopher Paul Curtis) so searching out longer works by those authors is a real treat. A few of the stories are about well-known characters, like Artemis Foul and Joey Pigza! Funny Girl: Funniest. Stories. Ever. ed. by Betsy Bird is an anthology of funny stories by female authors. These stories are hilarious. For real. Readers will recognize many of the authors’ names: Lisa Graff, Raina Telgemeier, Cece Bell, Libby Bray — to name just a few. The topics range from grandmothers to puberty. And, guess what, boys can read these funny stories about girls, too. The Mechanical Mind of John Coggin I read this hilarious book more than a year ago and I can’t believe I hadn’t book it on a book list, yet! This is a super quirky middle grade book! Fans of Roald Dahl will find it right up their alley. Young John Coggin has an unenviable job: he builds coffins for his nasty Great-Aunt Beauregard, who runs the family business. But John and his sister, Page, decide to runaway, and end up at the circus where they meet up with a host of crazy, zany characters, especially Boz, the human cannonball. Great fun! The Willoughbys by Lois Lowry. Do your kid like literacy references and tongue-in-cheek, melodramatic humor? Fans of Lemony Snicket will enjoy this tale of four children, Tim, Barnaby A, Barnaby B, and Jane who fancy themselves to be “old-fashioned” in the vein of book heroes and heroines. When their unpleasant parents go off on a world trip, the siblings are left with a not-so-odious-after-all nanny and end up being semi-adopted by their lonely neighbor who has taken in a baby found on his doorstep. I enjoyed this novel, but the rather wicked and irreverent and quirky humor is not for every child. I did like the Lowry included a glossary and a bibliography, written in the same gothic style as the rest of the novel. « 3 Preschool Science Resources that Will Last for Years! We just finished The Willoughbys, and I can vouch that it definitely deserves a place on this list! Can’t wait to check out the other titles!